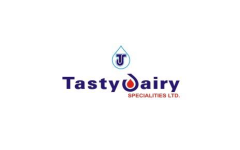 Business description - Tasty Dairy Specialities is currently involved in processing milk, along with bulk milk procurement and handling during season time which primarily caters to bulk and marquee institutional customers. The company is further involved in value added milk products like Skimmed Milk Powder, Butter, Ghee, Dairy Whitener, Concentrated Milk etc. The company is located in Uttar Pradesh and its manufacturing unit is situated at D-3, UPSIDC Industrial Area, Jainpur, Kanpur Dehat. With the existing plant and machinery, the company is capable of handling approximately 5,00,000 litres of raw milk which comprises of 1,60,000 litres of milk packaging, 20,000 litres of buttermilk packaging, 2,20,000 Litres of Skimmed Milk Powder and Ghee and 2,00,000 litres of bulk milk processing. These facilities are not only in close proximity to its milk procurement region but also to the target market. Tasty Dairy Specialities IPO allotment status is now available on Bigshare Services' website. Click on this link to get allotment status. f)	Whereas BSE not allowing continuous price bands upto 60%. This point not noticed by the surveillance department of BSE. Food and Dairy products will attract at high PE around 50 PE+ we are getting the Tasty at 20 PE is happy to get appreciation…..rest is on the management. When allotment will come because of no details showing about allotment date and listing date. Guys, what is the expected listing price for this IPO ? There is one more day left for subscription on 12th. Thanks Mahesh, we have corrected it now. But Expenses very high and PAT is very low! At the end of the day don’t you want to invest, especially in this brutal market, in a business in a very profitable company? This is awesome business, good quality!! Not cooked up books like others and that’s why you have lower business last year. It will be like ICe Make Refrigeration.